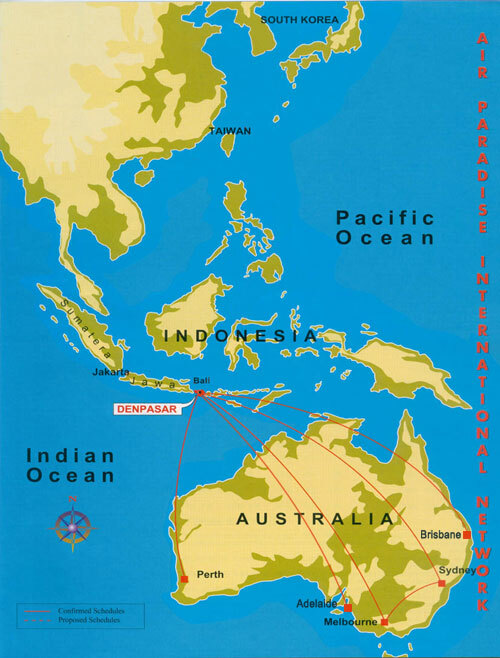 Air Paradise International was an airline based in Denpasar, Bali, Indonesia. It operated services to destinations in Australia, South Korea and Taiwan. Its main base was Ngurah Rai Airport, Denpasar. On 1 December 2005 the airline announced that it was ceasing operations due to a downturn in traffic following terrorist bombings on the Island in October 2005. In February 2007 the Indonesian Transportation Ministry delayed licence revocation of 11 major airlines, including Air Paradise, to give restructuring opportunities to the operators. Air Paradise was considering re-launching services in March 2007. However 3 years later after ceased operations in November 2008, the airline filed for bankruptcy just 5 months after another of its competitors, Adam Air, filed for bankruptcy in the same year. Air Paradise International is no longer in active service.